Do you have unwanted but usable outdoor gear sitting around? Why not ‘Gift your Gear’ by taking it along to your nearerst Rohan shop during March and groups like PaD will put them to good use! People and the DALES are very proud to be one of this years beneficiary organisations. 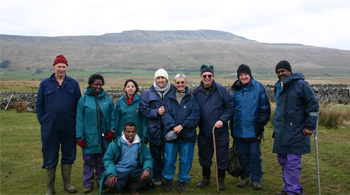 We have a wonderful stock of waterproof coats, trousers and fleeces thanks to a previous years collection and we set up a waterproof coat library with a group in Bradford who are doing lots of walking with their clients. This year we are hoping to benefit from some smaller sizes to support our work with young people together with a stock of rucksacks for people to use on PaD events. Read our latest newsletter here below and find out what we’ve been up to over the project. Why not try our walk of the month - chosen to enjoy the Dales at it's best and most beautiful whatever the time of year.